The transport truck arrived on New Year’s Day 2008 and three very animated and curious young toms emerged. We were immediately enchanted with them. 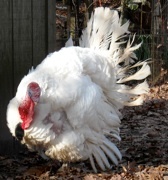 They were very agile and bonded to people, and frequently puffed out their feathers for us in a mating display. We named them Timmy, Tug, and Al. The first joints of their toes had been cut off and they had been de-beaked, which is standard industry practice and done without anesthesia the same day they hatch. They couldn’t eat normally, and had to fling their heads to get the food past their mutilated beaks. Through that winter, spring, and summer, they flourished. They followed us all around the property, doing their mating dance and gobbling at strange sounds. We kept them on a low calorie diet, rationing regular food, and supplementing with greens in the winter and watermelon in the summer. As fall approached, they became noticeably slower and arthritic. They looked elderly, though they were less than a year old. We began giving them medication for the arthritis and, while it may have slowed the progression, it didn’t stop it. So they ceased wandering, while all around them the agile chickens continued to run and fly. Science tells us that birds have a memory, but I didn’t need be told. I could see they remembered as they watched the others. When winter came, Al and Tug spent less and less time standing. Still, they always made the effort to hobble over to us and do their feather display. We’d tell them how handsome they were and give them some grapes or greens. Then in May 2009, Al could no longer stand, even with help. His legs weren’t able to support the enormous weight of his body, of the large breast meat demanded for holiday meals, and he was euthanized. Even at the end, he puffed out his feathers for us in a final sweet gesture, breaking our hearts. In August, we watched helplessly as Tug suffered the same fate. Now it’s just Timmy. Most days, he needs help getting to his feet first thing in the morning. We know his body will continue to fail, even as his spirit remains bright. It’s our sad task to play God and hope we choose the time that he would choose, if he could, of when to leave this life. In the meantime, he has the constant company of a few chickens and treats several times a day. After my chores each morning, I get a cup of coffee and sit with him. I stroke his soft feathers while he leans against me with his head on my knee, and I wonder how much joy he really has now and when I should let him go. I’m grateful that many years ago, a chicken came into my life and opened my eyes to the reality that all animals are the same. I’m grateful to be in a position to offer sanctuary to the few who find their way here. When I say a few, it’s difficult to convey this particular meaning of “few.” In North Carolina alone, 700 million commercial chickens are slaughtered for their meat annually, along with 39 million turkeys. I’m grateful for the growing number of people who find it unacceptable that animals are selected and bred to live and die inside misshapen and painful bodies. I’m grateful to people we’ve never met who send words of encouragement or a donation. I’m grateful to individuals who call to say they’ve saved a chicken from a horrible fate; these people have put forth considerable effort to find a home for their rescued chicken. I’m grateful for any small kindness toward these animals. I’m grateful to my friends who ask with sincerity about the chickens. I’m grateful to my good boss for bringing a watermelon for the crippled chickens when I couldn’t find any due to a shortage. I’m grateful to our veterinarian for her compassion. I try to focus on these things, and brush off the ignorant jokes of both educated and uneducated people. I continue my hope of the world becoming a more peaceful place for all.